USA’s Meryl Davis and Charlie White came out on top again in the second face-off this season with Canadian rivals Tessa Virtue and Scott Moir at the 2013 ISU Four Continents Championships in Osaka, Japan. USA’s Madison Chock and Evan Bates captured the bronze medal. Davis and White skated first in the last group and right before Virtue and Moir. They turned in a passionate performance of their dance to Notre Dame de Paris, executing all elements with confidence and skating with great flow. At the end, they remained a little longer than usual in their closing pose and then hugged tightly. The reigning World silver medalists earned a level four for all elements except the circular footwork (level three) to pick up a new season’s best of 112.68 (54.94/57.74) points. At 187.36 overall, they overtook Virtue and Moir to win the title. It felt like a strange déjà-vu what happened next. At first, everything went smoothly for Virtue and Moir. They attacked their powerful Carmen routine and drew the crowd into it when they suddenly stopped about 2.45 into it, just before their straight line-rotational lift. The team skated around in a circle, Moir talking to his partner, Virtue looking pale and anxious. Moir then informed the referee that his partner had an injury while she stood at the boards, but then they decided to continue. “When it stops, the moment is going by really fast so I can’t really recall exactly (what I thought), but we just need to make a couple of alterations to the program, tweak a couple of things, get out there and finish,” added Moir when asked about what went through their mind. At the ISU Four Continents Championships in 2011, there was a similar incident when Virtue and Moir stopped in their free dance, but at that time they withdrew from the competition. The Canadians resumed their program at the point of interruption, which was before the lift, executed the lift and other elements beautifully as if nothing had happened. The lifts, the spin, and the twizzles garnered a level four and the two step sequences were a level three. Virtue and Moir set a new season’s best with 109.20 (52.73/56.47) points, but dropped one spot to second at 184.32 points overall. “I think we’ll be back on track in no time and excited to train really hard for Worlds,” said Virtue. Chock and Bates danced to the bronze with a fluid performance to Doctor Zhivago, completing beautiful lifts, but they left a few points on the table when they got a level three for the twizzles and a level two for the diagonal footwork. As a result, they were ranked fifth in the free dance with a seasons best score of 94.98 points, but remained on the podium at 160.42 points. 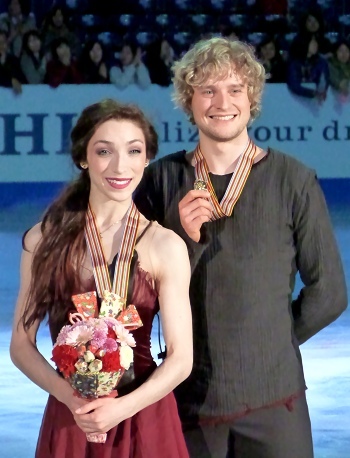 The Americans, who have been skating together for only 18 months, took their first ISU Championships medal as a team. Teammates Maia Shibutani and Alex Shibutani were not able to surpass their national rivals and finished fourth with 159.97 points. Their Japanese-themed Memoirs of a Geisha free dance was well-received and well skated. The siblings had a level four for five elements, but the circular step sequence was rated a level two. “We are very pleased with our performance today. We feel like it was our strongest free dance of the year. We got a personal best and the crowd was so amazing,” Maia Shibutani said. “We are very happy with our progress, not only throughout the season, but this week,” he added. Piper Gilles and Paul Poirier of Canada turned in a technically strong performance, earning the same levels as Davis and White. They placed third in the free dance, but remained in fifth overall at 157.83 points. Nicole Orford and Thomas Williams of Canada moved up from seventh to sixth with a lively dance to High Society and Now You Have Jazz (139.10 points). Japan’s Cathy and Chris Reed started well into their Beatles program, but Cathy fell in the diagonal step sequence and after that the siblings appeared cautious. They slipped from sixth to seventh with 131.04 points. “I felt pretty solid in that footwork and that twizzle was pretty straight, but my blade somehow slipped and I really have no idea what happened exactly,” Cathy Reed told the press. “Everyone’s support here has been genuine to us, and without this support, I don’t think we’d get to where we are now,” her brother Chris said. To skate to the Beatles is special for him.